PSYCLONE S-Video 12” AV Composite RCA/S-Video Cable Playstation PSX PS2 PS3 HTF! W o r k s G r e a t, Clean. PSYCLONE Pro Series Component Cable Gold Plated - Playstation PS1, 2 & 3 - 12 ft. Condition is Used. Shipped with USPS First Class Package. PSYCLONE Pro Series 12 FT Component Cable Gold Plated for Playstation. PSYCLONE Pro Series 12 FT Component Cable Gold Plated for Playstation. 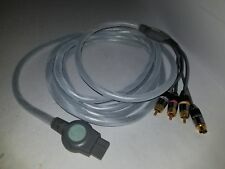 I am assuming this is the cable for PlayStation 1-3 from the research I have done, however I do not have a PlayStation to test it. Condition is Used. Selling as is. See photos. the item you will receive. the one shown in the photo. sure of what you will be buying. CONSOLES & ACCESSORIES. IN EXCELLENT CONDITION WITH OXYGEN FREE COPPER GOLD PLATED CONNECTION SURFACES DOUBLE SHIELDED INDIVIDUAL CONDUCTORS PROTECTS AGAINST INTERFERENCE. PSYCLONE S-Video 12' AV Composite RCA Cable Playstation PSX PS2 PS3 TESTED! The item you receive may slightly vary in physical condition from the picture. Item specific notes. 12 FOOT PYSCLONE PRO SERIES COMPONENT CABLE FOR SONY PLAYSTATION 1 2 OR 3CONSOLES. IN EXCELLENT CONDITION WITH OXYGEN FREE COPPER GOLD PLATED CONNECTION SURFACES DOUBLE SHIELDED INDIVIDUAL CONDUCTORS PROTECTS AGAINST INTERFERENCE. Features: Triple-shielded cable minimizes interference. 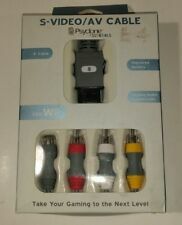 NINTENDO Wii ✔ PSYCLONE COMPONENT HEAVY BRAIDED AV HD CABLE CORD ✔ AWESOME! This is a Nintendo Wii Component Cable! PSYCLONE Pro Series 12 FT Component Cable Gold Plated for Playstation 3 PS3 T7. Condition is Used. Shipped with USPS Priority Mail Flat Rate Envelope. Psyclone S-video and AV Cable for Gamecube, N64 & Super Nintendo . Condition is New. Shipped with USPS First Class Package. Package does show some wear. Very good used condition with light, normal wear. See photos. the one shown in the photo. the item you will receive. CONSOLES & ACCESSORIES. 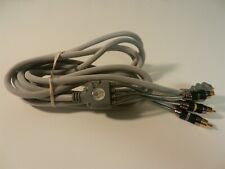 NINTENDO Wii PSYCLONE COMPONENT HEAVY BRAIDED AV HD CABLE CORD. Condition is Used. Shipped with USPS First Class Package. 1 S-Video, 1 Composite Video & 2 Analog Audio Outputs. MPN: RII603. Model: RII603. Item Type: Xbox 360. Color: Black. They maybe marked, or have identifying markings on it, or show other signs of previous use. It is used but in good working condition. This is a Wii Compatible AV cable. It looks like a. Condition is Used. The tie for the Digital Audio Output cap is broken but it still stays in place. Minor signs of use. Nintendo Wii Component Cable for Nintendo Wii & Wii U By Psyclone 12 Ft. Feet. Condition is Used. Shipped with USPS First Class Package. I get my items from all over the place and from different people. That being said there may or may not be a smell to some items. This is a USB cable for a Sony PSP by Psyclone Essentials. Item is new in box. Box has wear from age, has been in storage. Thanks for looking. Premium gold connectors for maximum conductivity. 12 foot shielded cable provides the reach you need. Experience crisp, clean and clear gaming with enhanced picture and dynamic sound. Built-in digital optical port for digital audio capabilities. Cord is in great shape and working great. This audio video cable for the Sony PlayStation 2 and 3 video gaming consoles is in excellent condition. This cable has been. (I am the original owner of this item). This is New In Box. For Xbox 360, Component Cable. Psyclone Component TV Video Cable - 12ft Cord Gold Plated Pro Series A/V. Shipped with USPS Priority Mail. XBOX 360 PSYCLONE 12 FT S-VIDEO A/V DIGITAL AUDIO VIDEO CABLE MONSTER STYLE! XBOX 360 PSYCLONE 12 FT S-VIDEO A/V DIGITAL AUDIO VIDEO CABLE MONSTER STYLE!. Condition is Used. Shipped with USPS First Class Package. NEW FACTORY SEALED 12 FOOT PYSCLONE PRO SERIES COMPONENT CABLE FOR XBOX 360CONSOLES. OXYGEN FREE COPPER GOLD PLATED CONNECTION SURFACES DOUBLE SHIELDED INDIVIDUAL CONDUCTORS PROTECTS AGAINST INTERFERENCE. Psyclone Universal RF Adapter - For PS2, Xbox, Gamecube - Lot of 3Wii AV Cable . Condition is New. Shipped with USPS Priority Mail Medium Flat Rate Box.